Much like Steve Bruce commented on in his post-match interview, I too felt from quite an early stage of this match that it was going to be Blackpool’s day. When Richard Kingson fumbled a shot around the post mid-way through the first half, it appeared than even when making defensive mistakes, the ball just was not going to hit the back of the Seasiders’ net. Fortune certainly played its part in ‘Pool’s fifth win of the season, but once more a steely grit about the way the side put their bodies on the line resulted in consecutive clean sheets on the road, and Blackpool’s first back-to-back victories this season. Looking at the game from a stats point of view, Sunderland’s own back room staff had told Steve Bruce just before his interviews with the assembled media how many chances they had spurned, with 30 shots failing to yield a single goal. Blackpool’s defence repelled a staggering 29 crosses into their box during the 90 minutes at the Stadium of Light, and those crosses that did find a Sunderland player were well dealt with by Kingson or wasted through poor finishing. ‘Pool’s two centre-backs, Ian Evatt and Craig Cathcart, have often had a tough job to do this season due to the attacking nature of Ian Holloway’s tactics, but it’s proved to be a fruitful partnership, with both men performing beyond expectations. Evatt is still disproving his lower league tag but is a player that typifies the attitude the Seasiders have. Cathcart meanwhile is a player that Sir Alex Ferguson may regret letting go, and looks a steal at £500,000. I actually thought Cathcart looked a little rusty and for the first time in a tangerine shirt made a couple errors that could have proved costly. In the end though, the rest of his performance more than made up for these and he and Evatt were rewarded with a clean sheet. For all the praise from pundits about Blackpool being a ‘breath of fresh air’, many critics like to point out that the defence is somewhat leaky. It’s a theory I’ve never particularly bought into, and the stats largely back this up. ‘Pool have now kept five clean sheets (all away from home), a record which only seven teams can better. The heavy defeats against Arsenal and Chelsea can be viewed as anomalous results and when taken out of the equation paint a much brighter picture, with an average of 1.27 goals conceded per game. When you consider ‘Pool have played 11 of their 17 games away from home, it’s not such a bad record after all. Even if you take two clean sheets out of the average to balance things up, it produces an average goals conceded per game of 1.46, again not horrendous with such a skew of away fixtures. Blackpool continue to surprise everyone but themselves, and with a trip to the City of Manchester Stadium up next, will hope their opponents in Sky Blue will underestimate them once more. 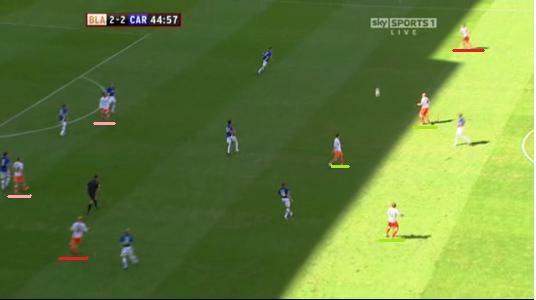 This season and last, Blackpool has been lauded for their adventurous approach to playing the beautiful game. The majority of the mainstream media point to the influence Charlie Adam has had on the way that Blackpool play. However, one player doesn’t make a team and Holloway has reshaped the way that Blackpool play and there are facets of that play that help make watching Blackpool a superbly enjoyable experience. For the focus of this article the spot light will shine on the full backs. What role do they play? How have they been playing and where (if any) has adjustment (in role) been made for life in the Premiership? The key protagonists who play the role of full back are currently Stephen Crainey and Neal Eardley, covering left and right respectively. The current back up is Alex John-Baptiste (right) and David Carney (left) with the clubs most loyal player, Danny Coid currently out on loan at Rotherham. It is unlikely that Coid will return to play a major part in our inaugural Premier League season, which is a shame, as injuries have robbed a technically gifted, composed, team player, of what promised to be a successful career. So the aforementioned group of four are the full backs at the club. If anything, Baptiste and Crainey are the most defensive from the four, Baptiste featured in the centre back position in the run to the play offs last season and an injury has curtailed his appearances this season. Crainey has also filled in at centre back, however, normally to cover a red card (See FA Cup 3rd game against Ipswich last year) or as Holloway throws another forward on and shuffles to three at the back (See West Brom earlier in the season). Carney has played on the wing for previous clubs and country and for Blackpool (see Newcastle earlier in the season when he played wide left to help stretch the play towards the end of the game). Neal Eardley is more of a modern full back, who likes to progress forward, possesses a good range of passing and can unleash a well placed shot. When it comes to Neal Eardley it’s important to understand the role that Seamus Coleman played in his development. Coleman arrived last season and shaped that full back role for himself in the run in. His commitment to pushing forward, anticipating passes, combined with an ability to dribble, beat a man and cut inside in to dangerous positions showed everything you’d expect from an attacking full back. Just one look at Coleman’s goal against Scunthorpe last year and you’ll see what he brought to the team. However, this served a dual purpose, firstly in giving Holloway someone who could perfectly play his desired full back role, but secondly it helped to sharpen the focus and desire of Eardley, who last season had been disciplined for behaviour that was unacceptable for Holloway. Two other players were a part of his downfall and they were also swiftly dealt with by Holloway. Judging by Eardley’s attitude this season, he appears to have focused his energy on working hard and putting what he already knew alongside the inspiration given by Coleman to cement his place at right full back after Baptiste’s injury. 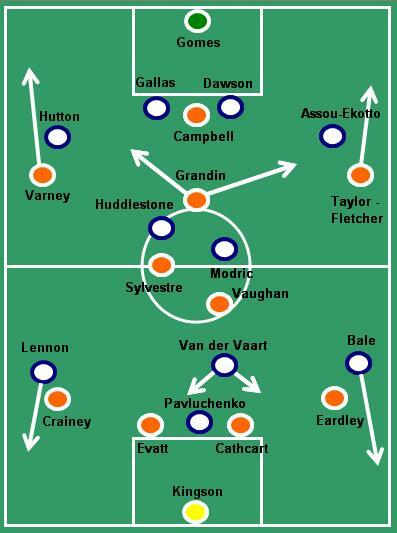 It has been discussed on this blog that Holloway has set roles for each of his team members to stick to, which all forms a part of his variant 4-3-3 system and the performance against Villa seemed to underpin that as the team with 10 changes from the previous game still shaped up and performed like a Blackpool side managed by Holloway. However, taking this further on, Holloway has the youth and reserve teams playing the same system as he stamps his signature across all levels. Indeed it is this long sighted approach that leads a lot of Blackpool fans to realise that Holloway is committed to this club in the long-term and vice versa. To stop crosses getting in to the box. Tackle your opponent so that they don’t get in behind the defensive line. Clear danger from loose balls or shots. Let’s run with that last idea as it’s the one that has been most noticeable during Holloway’s reign. 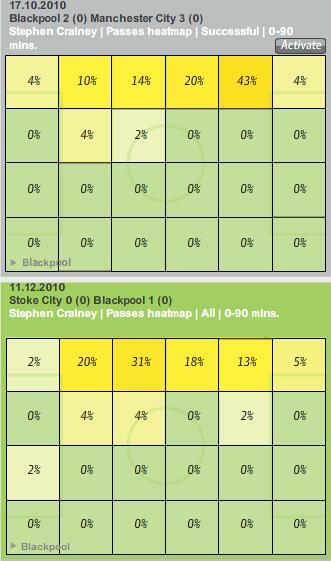 It appears that Blackpool use the full backs to apply pressure to team and force them deeper and deeper as Blackpool control possession. Certainly last season and even in to this season, the full backs will advance from their defensive positions for large periods of the game and drop in to what could be described as a midfield five as the team (in attack) morphs in to a pressured 2-5-3. 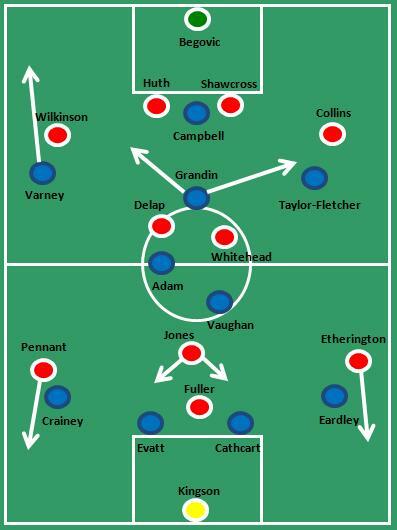 This is crudely illustrated below, but the outline does play out in reality as you can see in the subsequent screen shot from the play off final. As the full backs push up the midfield resembles a five man midfield and allows Blackpool to assert pressure and width on both sides of the pitch. 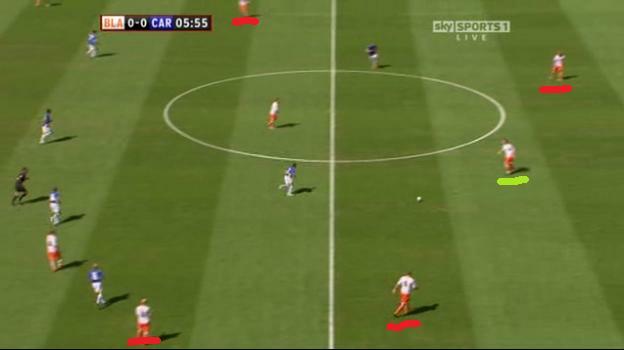 Notice how the full backs (red) have pushed right up to form a 5 with the midfield (green). This is fundamental to Blackpool’s adventurous style of play and is certainly not a new idea, but the sustained forward movement of the full backs helps to occupy the opposition, give Blackpool more passing options and the way they then link up with the attack and midfield adds an extra dimension to the play. The second leg play off semi final saw Crainey link up superbly and he was integral to the second goal at the City Ground, and this is a fine example of how Blackpool’s full backs can step up to midfield, attack and be devastating. This pattern has not abated now the team is in the highest division and is a part of what people reference as a ‘breath of fresh air’. The full backs are still advancing forward and there is little mention at Bloomfield road of full backs retaining their defensive position so Blackpool keep their defensive shape. In fact probably the most defining image of Stephen Crainey’s season has been the cross for Gary Taylor-Fletcher at the Emirates, which demonstrated that home or away Holloway did intend to attack the Premiership. Highlighted in red above is the movement of Crainey in the final third. The upper example is of a flowing passing move culminating in a cross at the byline from Crainey. The lower example showing Crainey deep in the Arsenal half getting a cross in that was nearly converted by Gary Taylor-Fletcher. An example of a full back that has a brief to hold his position and not advance forward. No passes in the final third and only 24% of his passes are in the opposition half. For the purposes of this next analysis, Stephen Crainey is the focus, mainly because he has been a virtual ever-present this season and also because it took an absolute age to graft these stats together, so the thought of doing the same for Eardley and Baptiste was crippling and will be left for a rainy day. Let’s look at Crainey’s basic stats and see how he’s doing. It would be safe to assume that in the breakdown of his stats any strengths and weaknesses could be spotted. First up, from a passing perspective, Crainey uses the ball wisely and well, racking up an open play pass completion rate of 83% which is higher than the team average of 78%. Added to this he sees a lot of the ball too, in fact in the game against West Brom (admittedly they were down to nine men) Crainey got close to the magic 100 pass mark, racking up 99 at a completion rate of 94%. This is an essential component for any full back, but especially one who advances in to midfield and sometimes attack. Should his pass completion drop then it’s safe to assume he’ll either have given the ball away high up the pitch leaving exploitable space in behind him or in his own half which should only lead to opposition pressure. In the tackle Crainey had a perfect start to the season taking him 5 games to lose his first duel, however, since then he rarely loses his battles and this is testament to his overall ability to improve. At the start of the season he was considered by some fans to be a potential weakness in the back line. At times he appears to be slow to get up to full running pace and given that he has a remit to attack it was feared he couldn’t cover ground backwards to track wingers runs and teams would be able to get decent ball in to the box from their wide right. At this moment he has a tackle success rate of 60%. Crainey not only passes the ball well, but where he passes the ball from shows where he holds his field position and helps to add great depth to the understanding of the role he plays. As stated earlier Holloway wants his full backs to stay wide, when looking at the heat maps of Crainey’s passing this wide element to his game is perfectly backed up. In fact 87% of his passes took place in the flank zones. 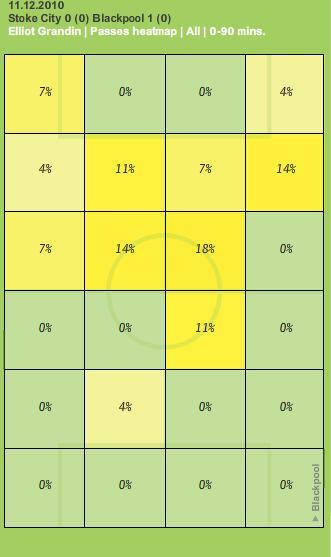 Added to this to back up the pressure aspect of his game, Crainey’s passing heat maps also show that the majority of his passes take place in the opposition half. This helps to back up the attacking nature of the team as a whole, but also of the full back as well. In some games as much as 69% of his passes were made in the opposition half. However, since the West Ham game a small change was detected in Holloway’s approach and since then it appears that the full back role has been tempered somewhat so that Blackpool aren’t left as vulnerable as they have been at times this season. In fact in his last three games he has spent more of his time in his own half, which hints at a curbing of the attack minded full back. It will be interesting to note it this trends continues to emerge. If so, could Blackpool start conceding less, scoring less and becoming less of a ‘breath of fresh air’. Note how in the upper chalkboard Crainey made 67% of his passes in the opposition half, whilst in the last game he retreated more making only 38%. It has been mentioned that the full backs advance to add an extra dimension to the team, however, a by-product of that is also starting to emerge. This was first noted from a post by Zonal Marking on the emergence of the sweeper again in the modern game. If you read that article and notice the diagram of how the full backs pushing up means that the centre backs have to spread and a central midfield player drops to cover, then the same applies to a degree with Blackpool. 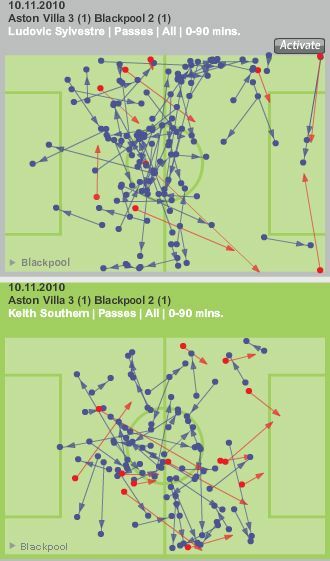 This goes some way to explain why not many teams have been able to exploit the space left behind by Blackpool’s advancing full backs. On another point, the diagram below backs up this move, as you can see that Evatt and Baptiste spread wide while Crainey and Coleman advance, with Adam dropping in to defence to either pick up the ball from a centre back or act as cover for a quick break. What you can see here is the defence (red) is split as Crainey (red) at the bottom left of the picture advances and Evatt and Baptiste spread out, leaving Adam underlined in green to drop back to form a back three. An interesting point to note on this for the future of Blackpool and Charlie Adam is that he is totally comfortable dropping that deep and can only help to add a further dimension to club and player. In fact Adam himself said (in the match day programme for the postponed Manchester United game) that he sees his favourite position as that of a centre back. Perhaps watch out for Adam to feature more and more as a modern-day sweeper, giving assurance and cover to defence whilst adding creativity and link up play in attack. 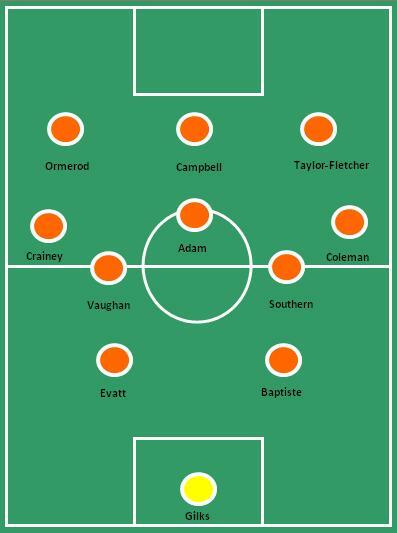 If Blackpool move in to 2011 still developing and improving, perhaps an added defensive resilience will be added to the full back area in addition to their positive forward movement, the implications of this may well see Blackpool continue to perform above expectations. Holloway will hope that Crainey will sign a new deal and not leave on a free in the summer, however, should he leave, then Holloway will be looking for an endurance athlete, with a midfielder’s passing ability, attacking anticipation and a superb sense of positioning. Not sure that is available in the UK for the budget Blackpool have, but Holloway will hope that Gary Penrice will have something fitting that bill from Eastern Europe. Blackpool took the three points again from a side who supposedly have better players and made pundits come up with the ‘breath of fresh air’ phrase yet again. In a couple of ten minute spells in either half Blackpool played superb, controlled, passing football, moving Stoke around the pitch and carving out chances. While Stoke played to their strengths from set plays and came very close to breaking the goal line. Blackpool stuck with the same starting eleven from the Bolton game two weeks ago, whilst Stoke welcomed back Andy Wilkinson and Jermaine Pennant back from injury and took their place on the right hand side of Stoke’s formation with Robert Huth moving back in to his preferred centre position, Jon Walters and Danny Higginbotham dropped to the bench. Stoke’s shape remained in a rough 4-4-2 throughout the first hour and only once Tuncay was introduced did they have any variation as he dropped in to something more like a midfield three and with the final throw of the dice, Pulis opted to take off a defender for a midfielder and go to a back three. 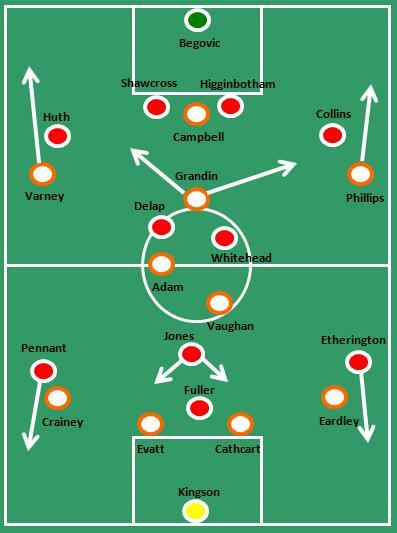 From the Blackpool perspective, the only noticeable change was a subtle one in midfield with David Vaughan sitting deeper in front of the centre backs, presumably to pick up Kenwyne Jones as he withdrew from the front line. 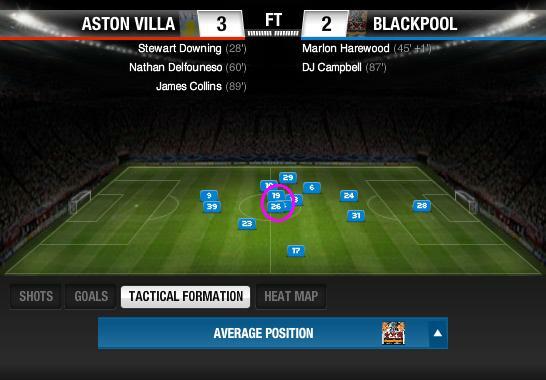 Notice how Vaughan (circled in pink) holds a deeper position, more like a holding midfielder. Another interesting observation from the average positions above is that DJ Campbell (39), due to his dropping deep to receive the ball, held a deeper average position than Elliot Grandin a member of the recognised midfield unit. This gives Blackpool a platform to attack from and Campbell with generally pass back to Adam or look for little passes or flicks for Grandin to run on to. The first half was an even affair with chances for both sides, but as mentioned in the preview a moment of magic from Ricardo Fuller could have given Stoke the edge. Prior to that Blackpool dominated possession as Stoke’s midfield appeared to be dropping deeper and deeper. Earlier in the game Stoke worked hard to deny space to Blackpool’s midfield and it worked well as Blackpool started to misplace passes. However, once Stoke backed off Blackpool operated well in the spaces and played between their lines well, got good width and constructed some excellent overlapping passing moves especially down their left flank. Stoke’s main threat came from set pieces, although Blackpool defended poorly at times, failing to pick up men in the box and giving too much time and space for Fuller to hit the bar. The second half started with Stoke almost making the breakthrough, but it was Blackpool who actually did and Charlie Adam was again at the heart of the play and as mentioned a few weeks ago, if Blackpool can get the ball to DJ Campbell close to the 6 yard box with the ball at his feet he will generally get his goals. Stoke were guilty of letting Campbell get that close and will be unhappy with that. Blackpool had some great control of the ball for a period before Stoke tried everything to get on level terms and sharp keeping, goal line clearances and the bar ensured that they failed to find the net. 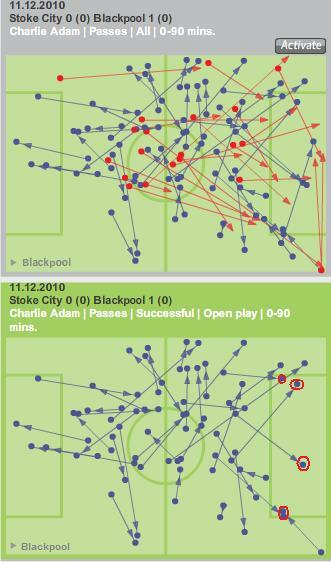 Charlie Adam was the focal point of most of Blackpool’s play, he attempted more passes (63) than any other player on the pitch, however, his success rate was low (66%, the team average was 72%), but that is mainly due to the fact he is given the freedom to try the unique which sometimes works and sometimes doesn’t. Stoke allowed him too much space at times and Adam will revel in that as the more time he has, the more time he had to vary his pass direction. Earlier in the season he developed a left leaning bias to his passing that made him readable, however, a look at his chalkboard shows how penetrative his passing was and how much variation in pass direction there was. His ball for the Grandin chance on 39 mins was sublime as was his passing in the lead up to the goal. 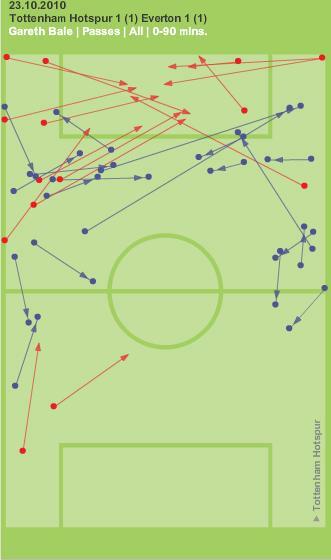 The top chalkboard shows the wide variety of pass (even though slight with a left bias), whilst the lower chalkboard shows how he successfully made passes from open play in to the Stoke box. An article by Zonal Marking last week introduced a concept called the ‘central winger’ and it appears that this might go some way to explaining what Holloway sees Grandin’s role to be. He certainly isn’t a traditional playmaker and at his previous clubs he has been played on the wing. When looking at his chalkboards then you can see he drifts to the wings and this was central to some of the excellent passing moves that Blackpool constructed in the wide areas. Given that Grandin’s last two performances have been excellent, could it be that he has learned the role that Holloway wants him to play? If so, is this important for opening up space for Adam to move in to and operate? 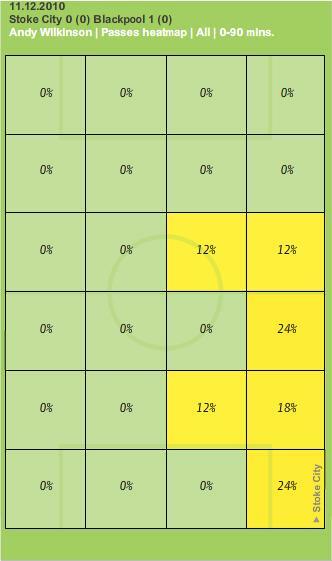 Grandin's heat map from his passes show his drift to the wing areas with 36% of his passes on wing. 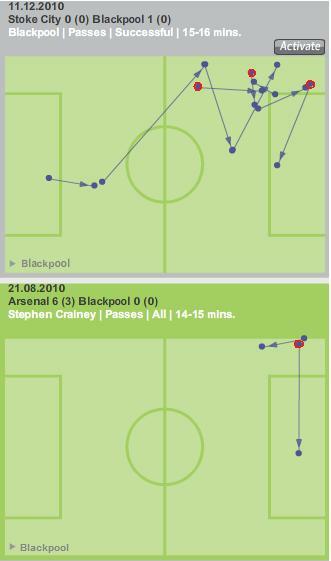 Blackpool dominated in the pass having attempted 112 passes more than Stoke. The danger for Stoke is that they played in to Blackpool’s hands, Blackpool attempted 445 passes with a 73% completion rate. 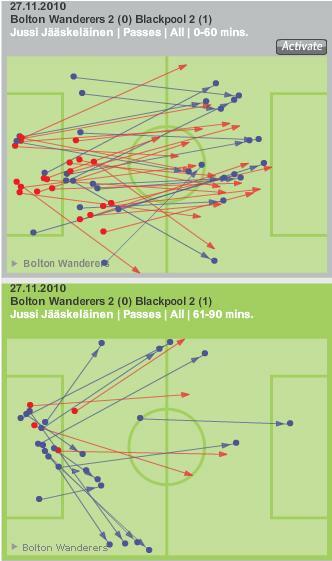 The teams that have stopped Blackpool passing the ball with a fluency have had the most joy against them (Blackburn worked hard to ensure that Blackpool completed only 67% of passes). Give them the ball, time on the ball and Blackpool have proved that they will create chances in the Premier League. Stoke mainly hit long balls from the ‘keeper as Bolton did the other week and had little joy from that approach, however, Stoke know their own game and are happy to play it. With two central midfielders (Combined, Whitehead and Delap attempted 61 passes, added to this 10 of Delap’s passes were his throws, which were largely unsuccessful) passing with such low amounts means that they have to over rely on the wingers to set up play in open passing moves. Blackpool move in to the Christmas period with a great 16 games behind them. Christmas looks like it will be a tough period and the time when the tiresome pundits will roll out the ‘injuries and suspensions’ nonsense as the next test for Blackpool. Charlie Adam is suspended for the Spurs game and Blackpool (according to www.physioroom.com) already have 6 players out injured, so we shall see. However, should Blackpool have at least another three points come the end of the first week of January then everyone at Bloomfield Road will be set for a second half of the season that will be as exciting as the first. Man Utd Postponement – Avoidable? So arguably the biggest home game of the season has fallen victim to the weather. Despite measures being taken to get the game on, referee Peter Walton was not convinced that the pitch would thaw out in time for the late evening kick off tomorrow. Is this merely a case of force majeure, or could the club have done more to ensure the fixture did go ahead? The immediate reaction from many onlookers has been to question why Blackpool, as a Premier League club, don’t have under-soil heating. I believe this is something of a red herring. Blackpool had barely even got to grips with being a Championship set-up, so after promotion through the play-offs, there was a lot of catching up to do behind the scenes. To the club’s credit, getting Bloomfield Road up to Premier League standards in little over three months was a fine achievement. With so many regulations to meet, anything not compulsory had to wait. For the time being, under-soil heating is one such optional facility. Should ‘Pool stay up this season then there is every chance that under-soil heating will be installed in the close season, but with a stand to construct, media facilities to fit-out and a new pitch to lay, there was simply no time in the summer for the luxury of under-soil heating. Postponements for frost is not a new phenomenon at Bloomfield Road. The chill last season caused two consecutive postponements against West Brom and Sheffield Wednesday. The club drew strong criticism then, amplified by the fact non-league neighbours Fleetwood Town were able to fulfil their fixtures after investing in frost protection covers Blackpool did not own themselves. In the wake of those two postponements, frost covers were purchased, and according to the club have been deployed since the middle of last week. With temperatures plummeting this week hot air blowers were brought in on Thursday and used throughout the night in an attempt to preserve the condition of the pitch. However further overnight frost on Thursday night resulted in yet more blowers being required on Friday morning. It seems as though this wasn’t enough though, with an afternoon inspection putting pay to hopes of the match taking place. Needless to say, many Blackpool fans have been dismayed by the outcome, citing embarrassment at the postponement. With the fixture due to be screened on ESPN, and with no other Premier League games postponed at the time of writing, the full glare of media attention will be on Blackpool’s inability to provide a pitch fit for purpose. ‘Pool have been looked down on in many quarters this season, and this latest news is only likely to add fuel to the fire for those who turn their nose up at the thought of Blackpool being a top flight side. Fans of the scheduled opponents are also having their say, with one prominent blog deeming it “not good enough”. Frankly their comments border on the ridiculous at times, with the suggestion that the game being called off could cost Man United the title being perhaps the most outlandish. One point they make is hard to disagree with though – the inconvenience to fans. No doubt this fixture was one of the first most ‘Pool fans looked for at the start of the season, with many people arranging their plans around it at significant cost in some cases. It’s inevitable some people will now miss out on the re-arranged fixture. The fact I’m even writing this article now indicates that not enough was done to ensure the game went ahead. Even ignoring the absence of under-soil heating, it looks as if the club were not proactive enough and did not have suitable contingency plans in place. After last year’s problems with back-to-back games being called off in December, one would hope it would encourage plans for winter to be firmly in place, particularly with cost not being quite the issue it previously was now Blackpool is a Premier League club. Then again, can the club really be held to account for the adverse weather conditions? Contrary to the beliefs of some of his critics, Karl Oyston does not control the weather and he would surely have wanted the game to go ahead. The cold weather has set in far earlier and harsher than in recent years, so to some extent these are extenuating circumstances. That said, it’s not as if winter is unforeseeable, and at the level the club now finds itself, it should be prepared for all potential situations, however unlikely they may seem. With another freezing winter on the cards, ‘Pool must act now to ensure this postponement is a one-off. Under-soil heating is not an option until next season, so the club must find other ways to avoid forthcoming home games suffering the same fate. I’m willing to reluctantly let the club off the hook for this postponement, but everything possible must be done ahead of the Spurs game on 19th December. The current frost covers are inadequate and a more advanced system must be looked at, and not left too late, as the hot-air blowers were on this occasion. Life in the Premier League can be unforgiving, and once more ‘Pool’s off-the-field activities have made things difficult for themselves by being reactive rather than proactive.